The duchy of Brunswick was formed out of the possessions of the senior branch of the house of Brunswick. (...) The house of Brunswick or Guelph [Welf] family was divided in branches (...) in 1546  Henry duke of Dannenberg founded the senior line that was later called Braunschweig-Wolfenbüttel and ruled over the duchy of Brunswick, becoming extinct in 1884. (...) The younger line of Braunschweig-Lüneburg-Calenberg ruled over Hanover. (...) Both branches used in their arms the two lions of Brunswick (said to be granted by the English king to his son in law, the duke of Brunswick in the thirteenth century), the blue lion of Lüneburg and the white horse [on red] of (Lower) Saxony. The branch of Brunswick-Wolffenbüttel died out with duke William 18th October 1884. 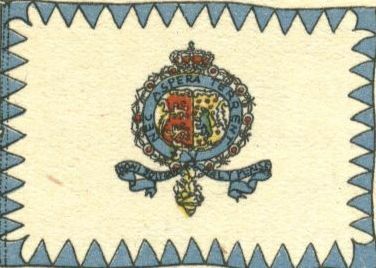 Neubecker 1939a shows the standard of Herzog Wilhelm von Braunschweig 1831-1884 as a white flag bordered with blue triangles (Zackenrand) and on the middle the Duchy of Brunswick (lesser?) coat-of-arms, flag proportions approximately 5:7  but could well represent a 2:3 flag since the image shows a waving flag. See this scan. Neubecker says that Duke William used a standard with Zackenrand being strongly pro-Austrian. 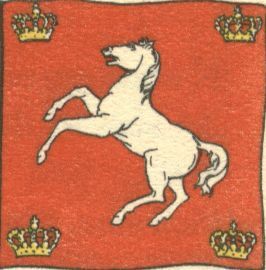 The standard of the dukes of Brunswick given by Siebmachers Wappenbuch 1878, shows the white horse on a red cloth. There could be an explanation for the change in duke Wilhelm's standard. In 1866 when war between Prussia and Austria threatened, Brunswick did not support Prussia in the Bundestag June 14th 1866 and wanted to stay neutral. Soon after however it went over to the Prussian side. As Duke Wilhelm's standard with its triangles was rather Austrian in appearance, that could be a reason for changing it. On the other hand, according to Norie and Hobbs 1848 Hanover used the same standard with the horse (in yellow, which is heraldically not correct so probably a mistake). As Hanover was annexed to Prussia in 1866 it is also possible that the Dukes of Brunswick wanted to continue the then already more than 1000 years old tradition of the Saxon Horse (Sachsenross), which is found in northwest Germany, the Netherlands and in southeast England. This would be consistent with the use of the horse by Duke Ernst August after 1913. Braunschweig Regent [reported (in Flaggenbuch?)] 1905: Prussian royal standard. The branch of Brunswick-Wolfenbüttel died out with duke William 18th October 1884. Brunswick and Hanover should have been rejoined at that time, but Prussia had annexed the Kingdom of Hanover in 1866 and now prevented the younger branch of the house of Brunswick from taking up the ducal crown. In 1913 peace was sealed [between the House of Brunswick/Hanover and Prussia] with the marriage of prince Ernst August of Hanover to Victoria Louise, daughter of the German Emperor William II. This couple was then enthroned in the duchy of Brunswick. The flag they adopted shows however very much the British pattern in its form and contents. In the first and fourth quarters are the two lions of Brunswick, in the second and third the lion and hearts of Lüneburg. In the centre are the arms of Hanover but now with a ducal [not royal] crown. Source: Neubecker 1933, p. 61. Neubecker 1939a shows the same banner-of-arms, but adds a much simpler car flag for the duke, Autoflagge des Herzogs Ernst August von Braunschweig 1915, a red square flag with the Saxon white horse on the middle and a crown on each corner. See this scan.